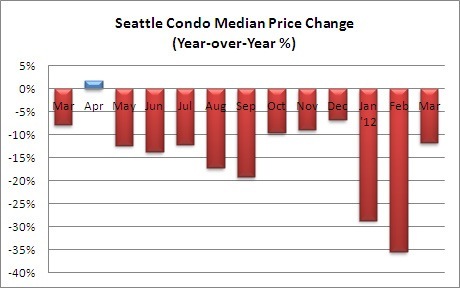 The Seattle condo market tightened in March with increased unit sales combined with a diminishing condo inventory and improving median sale prices. 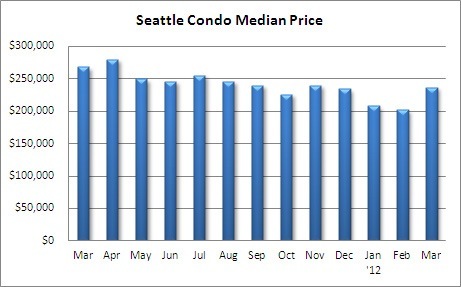 Overall, the citywide median condo sales price increased 17.1% over February to $236,500. Compared to last March, however, the median sales price reflected a 11.75% decline. Though, the gap narrowed last month. Condo sales took off in March. Whether due to better values, low mortgage interest rates, greater confidence in the local economy or a more conclusive buy vs. rent decision, people are buying condos in Seattle. 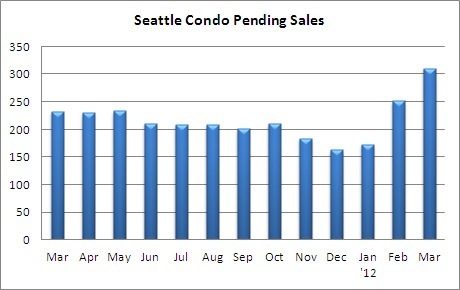 Pending transactions (offers accepted and under contract) spiked 23.4% over February and 33.5% over last March. 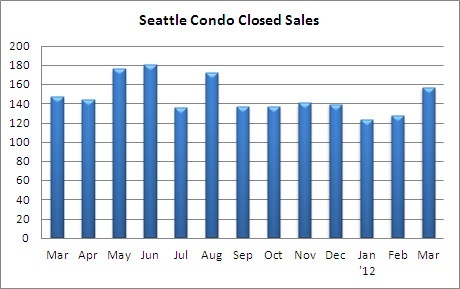 Excluding the tax credit bump in April 2010, the 311 pending transactions in March reflected the highest number of Seattle condo unit sales since August 2007, just before the market collapse. The number of closed condo sales also improved last month, rising 22.7% over February and 6.8% over the same period last year. The trend should continue as we move forward through the summer season. 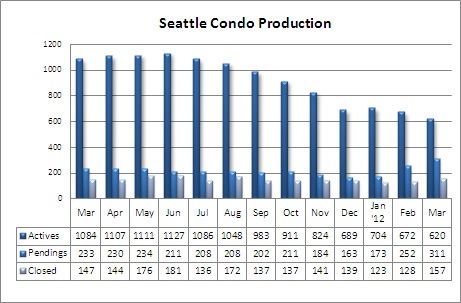 Seattle’s condo inventory shrank 7.7% from February to 620 units last month, and compared to a year ago, there were 42.8% fewer condos for sale in Seattle. 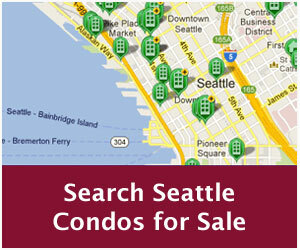 Interestingly, I still hear from people who believe there is an excess of condo inventory. To put it in perspective, we are now at pre-construction boom levels and down 60% from the peak in 2008. 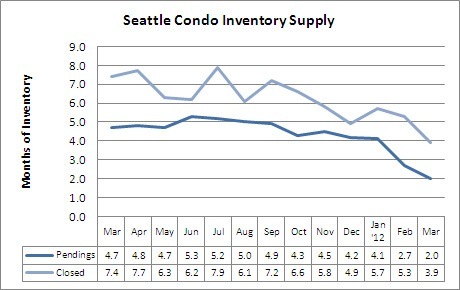 With constricting inventory and rising sales volume, the Seattle condo inventory supply rate dropped to 2-months of supply based on pending transactions, reflecting a seller’s market. Presently, active condo buyers are finding a dearth of supply in the sub-$300,000 price level, while multiple offers that result in sales over asking price are starting to increase in frequency. Does that mean we’ll see prices start to rise? There will be condos that’ll sell over their asking prices and in my opinion we may see positive year-over-year median price figures by mid-year. Though, they will be tempered by the number of distressed properties, which account for one of every four condos for sale, keeping pressure on condo prices. An improving market may encourage some sidelined sellers to test out the market, thereby increasing supply. 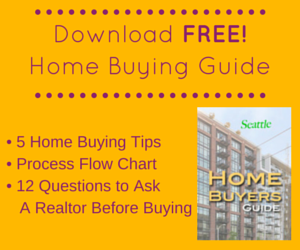 Northwest Seattle (north of the ship canal and west of I-5) was one of the only areas in Seattle that exhibited an increase in median sales price, rising 3.7% over the same period last year. 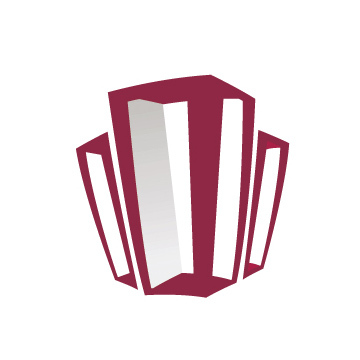 It also reflected the largest increase in pending and closed condo sales, jumping 67.7% and 60% year-over-year, respectively. West Seattle had the tightest inventory supply in March with less than half of the number of units for sale compared to a year ago. The Queen Anne / Magnolia area reflected the worst overall results with a 17.7% drop in median sales price and a 26.7% decline in closed sales. © SeattleCondosAndLofts.com, part of Living Northwest | Keller Williams Greater Seattle.